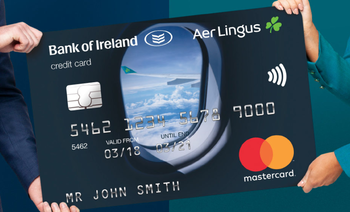 Last weekend we did a long article on the new Bank of Ireland Aer Credit Card, earning Avios in Aer Lingus AerClub. My review of the Aer Credit Card is here. You can now apply for the card via this page of the Bank of Ireland website. A VIP terminal you can use with a Priority Pass! On Thursday we covered the new VIP terminal being built at Manchester Airport, which will allow any passenger willing to pay to bypass the main airport and be driven to their plane. Reader Andrew dropped me a note about his trip to Ohrid in Macedonia. 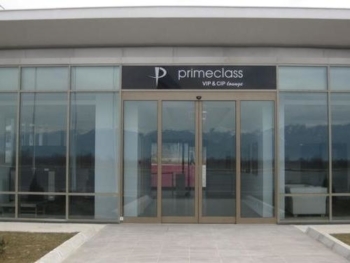 The Priority Pass lounge at Ohrid St Paul the Apostle airport is the VIP terminal as the PP website confirms. Andrew checked in at the main terminal, went through security and was then walked down the apron to the VIP terminal which is in a separate building (photo below). When it came for the flight to depart, they walked the 50 metres from the terminal to their WizzAir plane to Luton! Millennium Hotels, operator of any high end hotels in London, is running an interesting ‘Culture Vulture’ offer for anyone visiting for an event. Via this link, you can get a 20% discount on Best Available Rate. This is increased to 30% if you are a member of the My Millennium loyalty scheme which we reviewed here. You will also get a 2pm late check-out and 5,000 bonus MyMillennium points. The points are worth £10-12. You will need to show your ticket to an event, concert, conference or exhibition at check-in. If you are only coming to London to visit friends, or friends are coming to visit you, I’m sure there are plenty of free events on Eventbrite you could sign up to ….. The Thistle, Guoman and Amba hotel chains – which are all under common ownership, and which tend to move hotels around inside their three brands on a regular basis – have extended their January sale. It runs until 1st February and is good for stays until 2nd June (Amba) and 30th April (Thistle). Guoman stay dates vary by hotel. If you know you will need a room in London during this period then it is worth having a poke around. Our review of the Amba Marble Arch is here. The Thistle sale page is here, Guoman is here and Amba is here. The Thistle Heathrow is included. This is a horribly dated hotel BUT does let you take the driverless pods from the car park behind the hotel directly to Terminal 5, which is pretty cool. We told that story here. OT looking to go to HKG solo for one week… Best I can find it £400 return with Lufthansa in PE using the Amex 200 off 600 offer. Or does anyone out there have a 2-4-1 and want to go to HKG and don’t have someone else to use it with? Ha! Wish with 241 for solo BA reduced the miles cost by half! May be if VS gave enough competition BA might budge and provide such option for single ticket! Go for LH, you will get to share with somebody there too, even if upgraded to business. £400 for PE to HKG sounds like a great deal to me. Business is great but I’d rather spend the £600-800 extra even the best business deals cost in Hong Kong. 1) I have a 241 and heading HKG/KUL/SIN later in the year -when do you want to go? 2) I also looked at the LH PE with £200 off £600. When I came to book with Amex travel, they didn’t have availability on some of the cheaper flights, so if you haven’t already done so, might be worth checking on their site that they can access the same flights that LH are selling directly. If you book a flight redemption with a built in connection that has a tiny amount of time for the connection, will the airline put you on another flight if you miss your connecting flight? Or do they have no responsibility here? They’ll put you on next flight. Yes if it’s booked on the same ticket they have a responsibility to sort you out. Airline’s responsibility but check what options there are. If there’s a flight every few hours, it’s the airline’s problem; if there’s one a day and you need to be at destination as planned, it becomes your problem. OT – Rob, I mentioned in the comments that the Doubletree in South Ken is becoming a Curio Collection hotel. I was told last night at the Doubletree Westminster that it too is becoming a Curio Collection, and that is the reason why the Executive Lounge was closed, as part of the refurbishment. Not been at the SK one but hard to see how Westminster fits Curio branding. Tbh Hilton branding is increasingly confusing me. Did Westminster provide you free drinks given the lounge closure? Yes – and a snack! curio is 5* but not luxury. A good refurbishment for a London hotel would probably make it more curio than doubletree. Doubletree was just a conversion brand wasn’t it? No way is the south ken doubletree a 5* hotel. I stay there weekly, and regularly get a room for less than £130 per night if booked a few weeks in advance. Westminster was Mint or whatever it was called. The roons had imacs instead of TV. I loved this hotel, great upgrades, great staff, nice free gifts, cleanest hotel roons I have seen outside Asia, walking distance to three tube stations. Lounge was lousy as far as the room went but free flowing drink and ok snacks. Most nights rates offered great value for money as Dan also notes for DT SK. Comparedbto rates or ooints for ConradStJ it was often a steal. OT – Has anyone taken a plunge with Curve Metal? iOS App is already updated and is allowing Subscription upgrade. Also it looks like Amex Wallet is treated completely differently i.e. does not count towards annual limit. Is this correct, anyone on current beta can please confirm. I have exhausted the annual limit but still allows me Amex topup hence guessing it is the case. Have you spent on the wallet to find out? Topping up any spend (on the beta) hasnt counted but spend does. I have one but was not on the Amex beta so could only link a card today. Card is heavy and slips out of wallets. Blue one is a bit dull. Is a £69 upgrade to Club Europe good value on a BA domestic flight? If you need the tier points, yes. Otherwise depends if you have status anyway and whether you value the novelty. Depends if you value TP, fast track, lounge access, an empty middle seat and something to eat and drink on the plane. If the answe is yes to most or all if these then it is worth it. An empty middle seat alone = selling price/2. Business check-in, fast track, 2x23kg bags, lounge access, free middle seat, snack and a couple of drinks and 40tps vs 5/10/20 for economy. Only you can decide if it’s worth it. If you don’t have any status it’s probably worth it, especially if you have checked baggage. If you do it’s a relatively cheap and convenient way to top up TPs for renewal plus any value you ascribe to free middle seat and in-flight service. OT: Are there any bonus Avios given when renewing insurance with Alan Boswell? They have been offering them but there is no official rule, it depends on the size of your policy and if you ask nicely. Still awaiting for my 5000 since October. This was a new policy and they have been rather shy in dealing with my chasing. I appreciate avios.com changed but their admin in looking after this matter is very poor. I am thinking if their claims handling is a bad prehaps my relationship with them with be short term. I have given them plenty of opportunity to get back to me. Unfortunatly they dont seem particularly customer freindly when it comes to problems. They were rather more proactive in taking my money. Couldn’t see it mentioned elsewhere… the Curve app on iOS has been updated already, so you can already add your Amex card if on Blue, or upgrade to black/metal if you so wish. How can you tell?! I’ve just updated the app but there’s no indication that I can now use Amex with it. That’s strange – I didn’t apply for the beta. I was able to add my amex and validate it. I keep reading about the Curve discussion. Is there still time to apply for one? I read about beta version and that people should apply sooner rather than later. Is the main benefit no fx charge when abroad and ability to use Amex? Is there anything I should be careful about or just apply via the Curve website? New version launches 10am but no rush to apply. Millennium offer. Looks good to start with 30% off if you are a menber but…. Correct BUT the “best available rate” closes automatically at a certain point or the discount % changes, however this “culture vulture” product could be open much closer to the arrival date and it has the same flat 30%/20% discount as long as the hotel have it open. You could still get a very good deal though it if you book the right day at the right time.